Food is all around. Not just as something that we need to survive, but also in the form of books, supplements in papers, food blogs, super star chefs, Michelin starred restaurants, tv-programs, different “schools” and movements being the it-trend (like raw food is the big thing in Denmark right now), other movements going back. And os on. Old news I hear you say, and you are right. Food blogging is so not my thing, as well as I know next to nothing about food anthropology. Nevertheless, I have a great interest in food, cooking, books about food and that kind of unscientific research you can do by just reading cook books from a certain place or period. I would’ve posted this Sunday and made it a part of Beth Fish’s Weekend Cooking, but since I already made two posts this evening, I thought I would post this today insted. Anyway. When I look at old magazines with recipies, I have to smile sometimes, thinking: can you believe we ate that in the 70’es. And check out the plates they are serving this dish on and the glass they are drinking from. On the other hand, at least in Denmark there are very classical cook books more than a 100 years old still being used and re-printed again and again. I have some of those old cook books myself. But mostly I have books about food in the Ramsey, Nigella and Jamie-category and books with certain culinary themes like Danish food, Thai food, Indian food, Jewish food, Greek, Moroccan, American…well, you get it. I enjoy reading them all as well as cooking a dish or two. […] But the first thing you’ve got to understand is that there’s white trash and there’s White Trash. Manners and pride separate the two. Common white trash has very little in the way of pride, and no manners to speak of, and hardly any respect for anybody or anything. But where I come from in North Florida you never failed to say “yes ma’m” and “no sir” […] never forgot to say “thank you” for the teeniest favor. That’s the way the ones before us were raised and that’s the way they raised us in the South. In this funny and quirky book you will find recipes for fried and broiled squirrel, fried possum, barbecued alligator tail and swamp cabbage stew. But that is not all. You will also find the most delicious recipes on how to cook shrimp, crawfish, crabs and other kind of seafood that you find in abundance in the South plus lots of cakes and sweets. 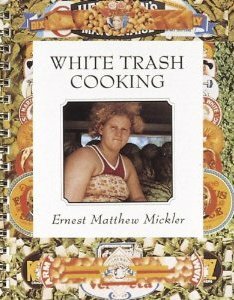 The book also states that White Trash-food has less fat (but there is still plenty of calories, though) than Soul Food and many other interesting facts you can read in the very well written intro. No, I do not think that I would find fried squirrel a particularly delicious thing to eat. And I don’t know what to say about the High Calorie Pick Me Up-drink, which is a bag of peanuts put into a cold coke, so that you can drink and eat at the same time. But Tutti’s Fruited Porkettes (pork chops with sweet potatoes, pineapple and bacon baked in the oven) sounds yummy, as well as Klebert’s Cold Crawfish Soup (with onion and potatoes) could easily find its way into my kitchen. I am not here to offend anyone, I truly enjoyed reading this book and leafing through the recipes, and the whole book has been written with much love. Have you ever cooked a squirrel? Or tasted swamp cabbage stew? I had an alligator sandwich in New Orleans and it was fab. I've always been curious about this cookbook and the fact that it has been reissued. Now you've made me want to run right out and buy myself a copy! I'd love to try alligator someday, and I never need to be talked into seafood and sweets. Beth, it is a great read. I enjoyed it a lot from an "anthropological" point of view, but I would also love to cook some of the recipes, no doubt. Just not fried squirrel (and I do not know where to get the squirrel in the first place, LOL). Linse, yep, I am back and very set in trying to blog talk a bit more than I have had the time to do before. What a funny cookbook! My dad grew up during the Depression and ate squirrel as a child, but I've never had it and hope I never have to have it.